Gold wedding dresses are truly unique! You don't see many brides wearing this color. Imagine the looks you will get when you walk down the aisle. This color would make any wedding dress "stand out." I can see why you might have your heart set on finding a gold bridal dress. But if you are a bride looking for gold bridal gowns, you already know how hard it is to find them. You don't have time to look through all the designers' collections to find one! Well I can't say I have made an exhaustive search, but in my surfing around the web I have come across a few designers who have gold wedding gowns in their wedding dress collections. Below are two gold wedding gowns by Justin Alexander. This gown will show off your body curves, so an hourglass figure would look best in this dress. Also if you have a short waist this dropped waist style will hide that fact. If you are large busted the corset bodice will fit you well and the tufted pick up style skirt will balance the top half of your body. This Justin Alexander dress has gold design embroidered on the gown with a gold belt. This is a mermaid wedding dress or trumpet wedding dress style. It will look best on you if you are an hourglass body shape. If you have a rectangle body shape you could pull this gown off with the right shape wear. Also, the tie belt is tied over to the side with hanging tails that takes gives a overall slimming appearance. The next two gold wedding dresses are by Anjolique. Isn't this gorgeous! The combination of the asymmetrical pleating paired with the mermaid shaping of this gown will enhance your curves if you have an hourglass or curvy body shape. Because of the asymmetrical pleating this dress will give the illusion of curves this dress would enhance your rectangle shaped body. This mermaid style wedding dress is best worn by a medium height or tall bride. If you are large busted, you may find this gown a plus for your figure as well. This beautiful a-line wedding dress will look great on most body shapes. The pear shaped body type would have to be careful because this particular dress may reflect your shaping. It may cause attention to be drawn to the hips and make the upper part of your body look smaller. On the otherhand, this will look great on you if you are rectangle shaped because the pleating will make your waist look smaller. The next two stunning gold wedding dresses are by Mon Cheri. The first one is a full skirt style. This would be a good choice for you if you have a pear shaped body. This style will highlight your upper body. This next dress is a form fitted one. This will compliment you if you have an hourglass figure. This will also work for you if you have a rectangle body shape and if you are large busted. The next gold wedding gowns are by Sophia Tolli. Take a look at this first dress! 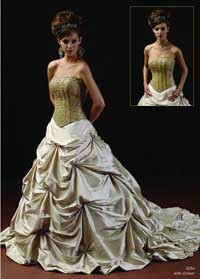 The bodice has figure flattering pleating and there is an eye catching drape on the over skirt. This will enhance a curvy shape and give the illusion of curves to a slender figure. The above dress is a unique design. If you are a bride who wants something different this gown delivers! Between the gold color and the design, you definitely have a memorable gown! Most figure types would be able to wear this dress. The pleating and the design detail would be figure flattering to you if have an apple body shape. 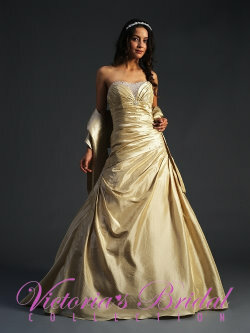 Here is another beautiful gold wedding dress from the Victoria's Bridal Collection. This dress has the asymmetrical pleating that will make just about any body shape look great. If you are rectangle shaped or have a tummy the pleats will enhance your figure type.